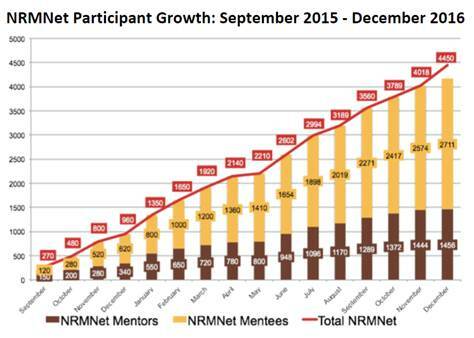 NRMNet experiences significant participant growth! The Research Resources and Outreach Core (RROC) of the National Research Mentoring Network (NRMN) funded by the National Institutes of Health was developed to provide enhanced networking, professional development training and mentorship experiences for scholars affiliated with the RCMI Translational Research Network (RTRN) and other diverse institutions. We partner with RTRN to deliver targeted initiatives that develop diverse scholars’ grantsmanship, expand their professional networks and enhance mentoring capacity across their institutions. We provide opportunities for in-person and virtual interactions with a cadre of coaches and mentors that are trained to help mentors and mentees engage in productive mentoring relationships and improve grantsmanship skills. We are developing an innovative virtual learning center, the NRMN Health Disparities Collaboratory with resources and curricula related to conducting health disparities research, including but not limited to, clinical and translational research, team science, and community engagement. Register a profile with net* to explore our programs and receive up to date information and news about our national activities. * Please select “NRMN RROC – Research Resources and Outreach Core” as your Partner Organization. Participate in our guided virtual mentorship program, designed to connect mentors and mentees across the nation.